Girona is 103 Km North East of Barcelona and many tourists fly into Girona on one of the many budget airlines like RyanAir and then make their way on to Barcelona or the Costa Brava. 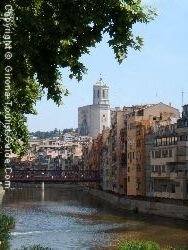 The Girona Tourist Guide will help you arrange your visit to Girona in Spain. If you want specific information to plan your trip e.g. transport or Girona airport etc look at our navigation panel to the left that has links to detailed pages on all aspects of Girona. Alternatively you can type in a few keywords into our Girona Tourist Guide search box which can be found at the top of every page and click the Go button to find pages that answer your questions. Girona in Spain is the city that is the capital of its own province. It is spelt 'Gerona' in Castilian Spanish and 'Girona' in Catalan, which is the primary language spoken throughout the province. Girona is in the north-east of Spain, and is bordered by France, and the provinces of Barcelona and Lleida. The province has a population of approximately 500,000 people, and covers an area of 5,886 km2. The province of Girona is divided up into regions as follows: El Alt Empordá, Pla de I'Estany, Selva, Ripollés, Cerdanya, El Gironés, La Garrotxa and El Baix Empordá. Girona is one of the most varied provinces of Spain. It has the well known coastal area of the Costa Brava, that offers both sandy beaches and secluded rocky coves. It has great flat fertile plains that are ideal for rural tourism and have many campsites, cycling and walking routes. The Pyrenees are close by where you can ski and snowboard all year round. Girona is 30 minutes drive to the Costa Brava. There are several access roads to various parts of the coast. You can take one of several secondary roads straight from Girona centre or you can take the A7 motorway, which is faster (but has a toll fee) and choose the exit from the motorway that is applicable to the part of the coast you want. The towns on the Costa Brava are well signposted from the A7 motorway. In relation to the Pyrenees, Girona is about one and a half hours drive. You can also reach France in roughly this time on the A7 motorway heading north. 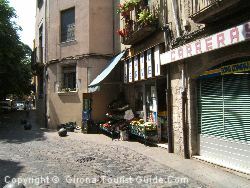 Gerona is approximately one hour 20 min drive on the A7 motorway to Barcelona. You need to head south, and Barcelona is well signposted from the motorway. If you heading to Girona from the north or south of the coast of Spain all you need to do is follow the A7 toll motorway for the fastest route. There are also minor 'N' roads that run more or less parallel to the motorway and have no toll fee, but they are single carriageway and therefore much slower. To travel to Girona from central Spain, for example from Madrid, you need to take the A2 motorway to Zaragoza and then get onto the A7 past Barcelona and continue north on the same road until the exit for Girona. 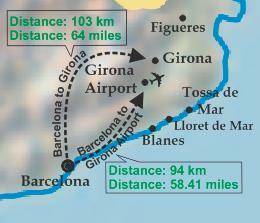 Girona airport is 20 minutes south of the city, and receives lots of budget flights. It is approximately one hours drive to Barcelona from Girona airport, and so many tourists heading for Barcelona find that flying to Girona is a cheaper option. You can then take the bus, taxi or hire a car to get to Barcelona. The city of Girona is not dependent on tourism and so it isn't empty in the winter like many coastal towns. The climate is mild in the winter and so Girona is also a great destination at this time. It has a peaceful feel all year round and is an excellent place to enjoy everything a small city has to offer, while escaping from the throngs of tourists and hustle and bustle of the coast. There are plenty of Girona tourist attractions for all the family. You'll find ancient buildings, botanical gardens, shopping centres and a myriad of outdoor sports. Girona, Spain has a lot to offer you. There are activities for families, couples, young and old. The province is extremely varied, and the city of Girona boasts a beautiful Historic quarter that attracts many visitors. Girona makes a great destination at any time of year due to its mild climate. 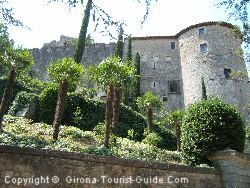 Girona Holidays - lists all the public holidays in Gerona. Girona Spain - an overview of what Girona has to offer you. Girona Tourist Information Office - find out where they are at what they offer.